Some people have great substance. They have the resources, knowledge and skills required to succeed in their chosen field. They then need to apply these resources properly. 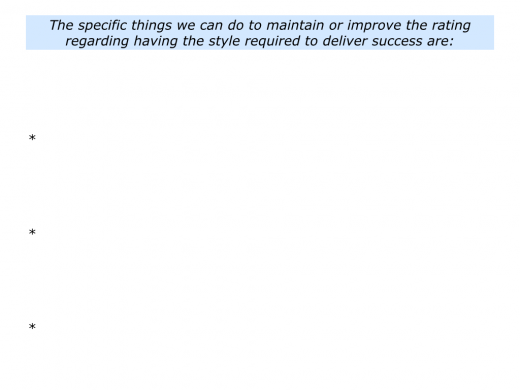 This calls for demonstrating the appropriate style – the right strategy and savvy and – required to achieve success. Some people get into difficulties, however, when they have knowledge but fail to apply it in the most appropriate style. They may communicate poorly, pursue the wrong strategy or behave in other ways that lead to failure. 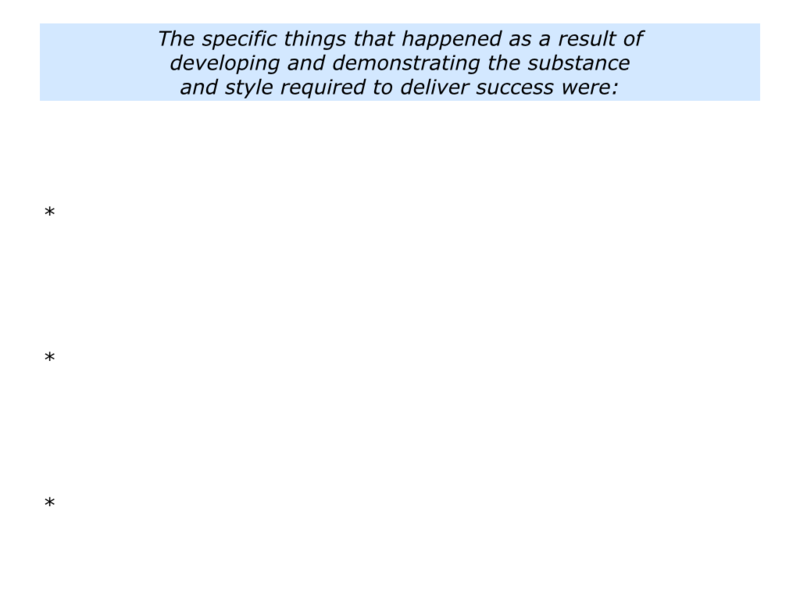 Looking back, can you recall a specific situation when you did fine work by scoring highly on both substance and style? You may have been pursuing a personal or professional project, leading a team, contributing to an organisation or whatever. 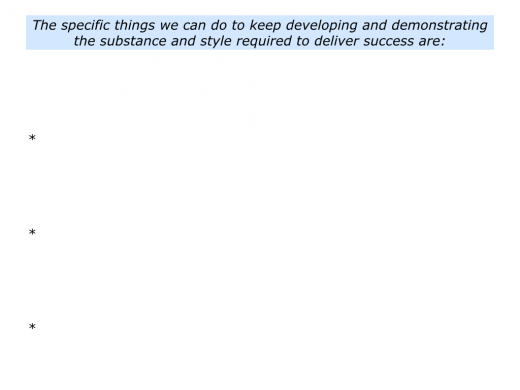 What did you do to develop the substance – the required resources, knowledge and skills? 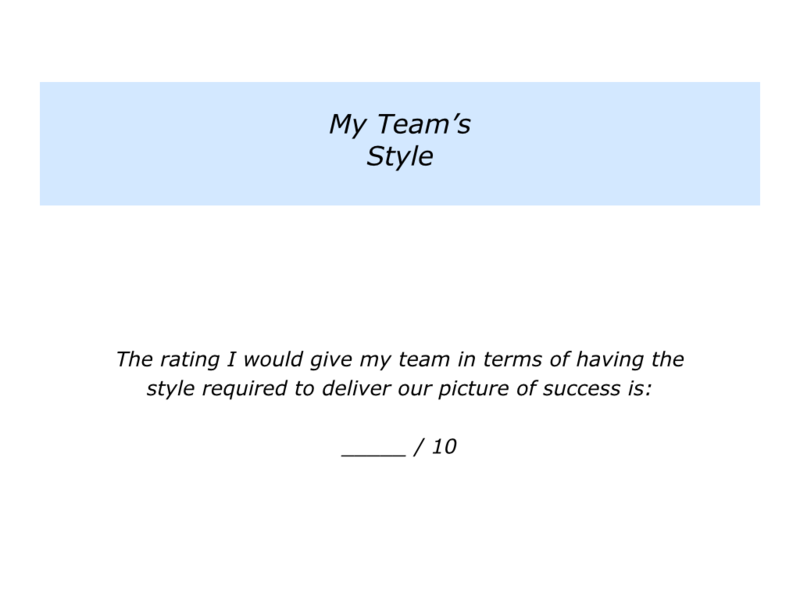 How did you apply these qualities by following the appropriate style for delivering success? What happened as a result of taking these steps? Leaders sometimes apply a similar approach to improve their teams. Imagine that you lead your present team at work. You may want to explore the following themes. 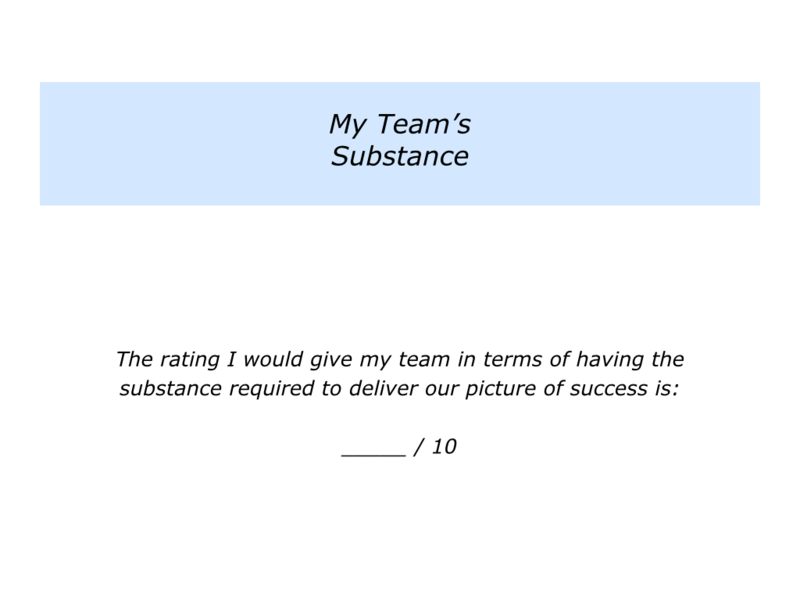 On a scale 0 – 10, how highly would you rate your team in terms of substance? 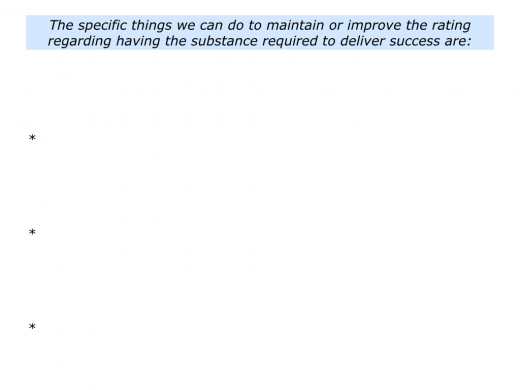 To what extent does it have the resources, knowledge and skills required to deliver success? Every team can improve, but you will want to score at least 8/10 in this area. People will then have the foundation to consistently deliver the goods. How can you ensure your team has substance? You need to have the right people with the right spirit, strengths and knowledge. They also need to apply their experience in ways that achieve success. 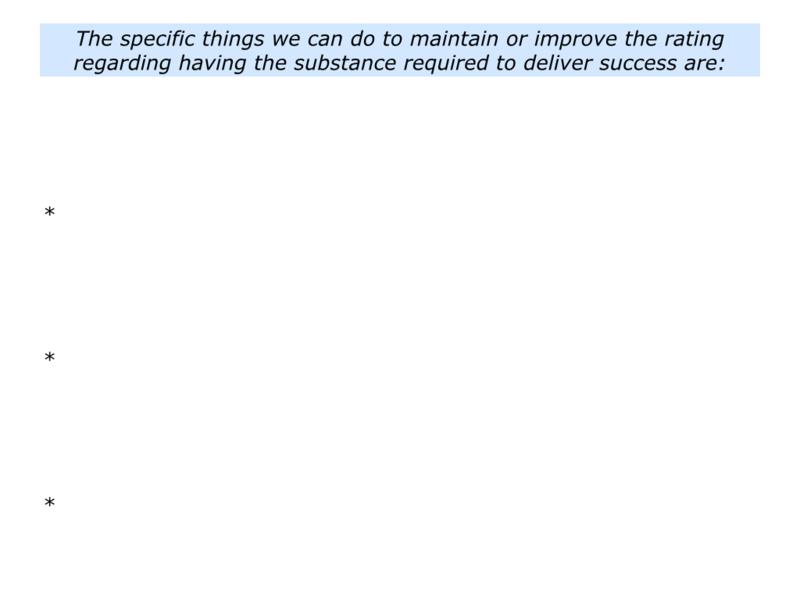 Imagine that your team scores 7/10 in terms of substance. How can you improve the rating? Here are some ideas. You can keep encouraging the people who add to the team’s substance. Spend time with the team members who are positive, professional and want to achieve peak performance. You can encourage the people who want to develop and who have the required ability. If appropriate, you can also recruit people who have the right spirit, strengths and skills to add to the team’s substance. You can educate the whole team to keep developing. One approach is to invite people to make suggestions regarding how the team can develop its resources, skills and knowledge. 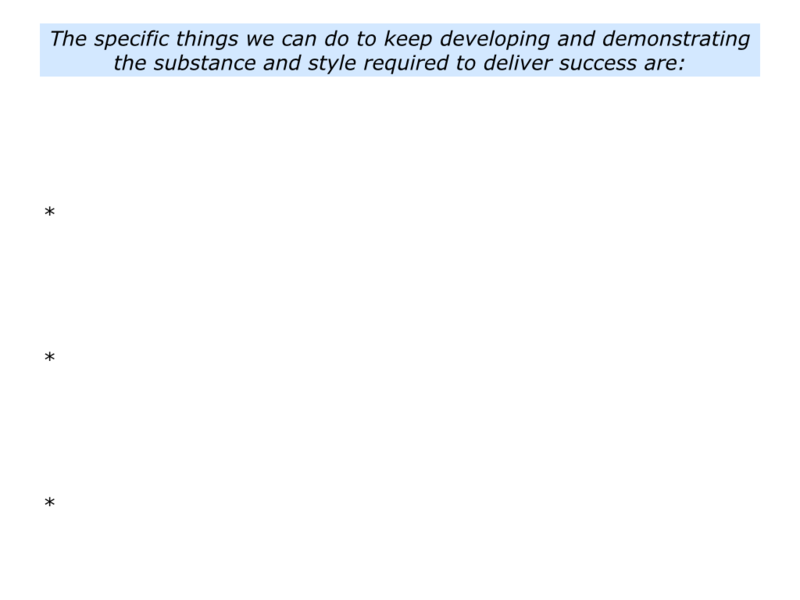 You can then add you own ideas and create a development programme for improving the team’s substance. On a scale 0 – 10, how highly would you rate your team in terms of demonstrating the style most likely to achieve success? To what extent does it apply the appropriate strategy and savvy? You will want the team to score at least 8/10 in this area. 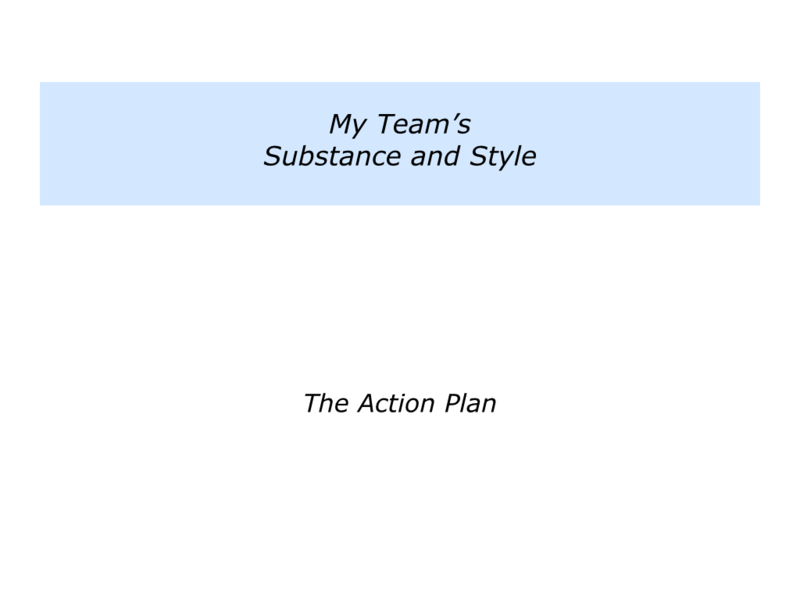 Bearing in mind the team’s picture of success, you may want to explore the following themes. What are the key strategies we can follow to give ourselves the greatest chance of success? How can we keep doing the right things in the right way? How can we co-ordinate our strengths to achieve the goals? How can we manage the consequences of any weaknesses? 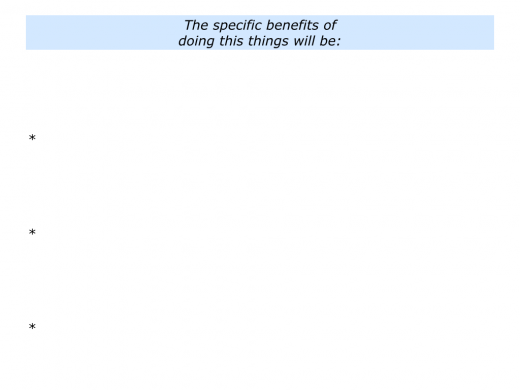 How can we manage any other practical tasks that must get done? How can we keep doing superb work? How can we anticipate and manage any potential challenges? How can we do whatever is necessary to achieve the picture of success? Imagine that you have clarified how to maintain or improve the ratings. How can you translate your ideas into action? One leader chose to add more substance to their team by recruiting a knowledgeable expert. She explained this in the following way. We eventually hired an expert who really wanted to contribute to the team. The process took several months, however, in order to avoid previous mistakes. Several years ago we hired three ‘grey hairs’ who were supposed to add credibility to the team. It soon became apparent, however, that they simply wanted to carry on doing what they had done as freelancers, whilst getting a steady pay cheque. We want people who are prepared to help their colleagues to succeed. Unfortunately the grey hairs saw themselves as above such matters. It proved an expensive mistake and they were soon asked to leave. Building on these lessons, we did our due diligence before hiring the new expert. This meant explaining the professional deal to potential hires. We said something along the following lines. “We want people to use their talents to add to the team. At the same time, however, it is important that they want to follow the team’s agreed principles. “We believe in the value of collaboration. We employ people who want to build on their strengths, encourage other team members and help all their stakeholders to succeed. We interviewed three candidates and hired the person who, whilst being a strong personality, showed they really wanted to contribute to our culture. 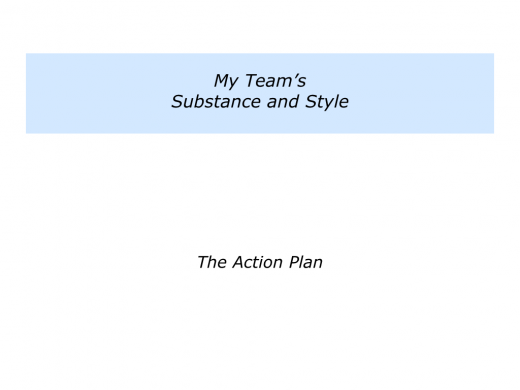 Different leaders choose different ways to add substance and style to their teams. You will have your own approach. 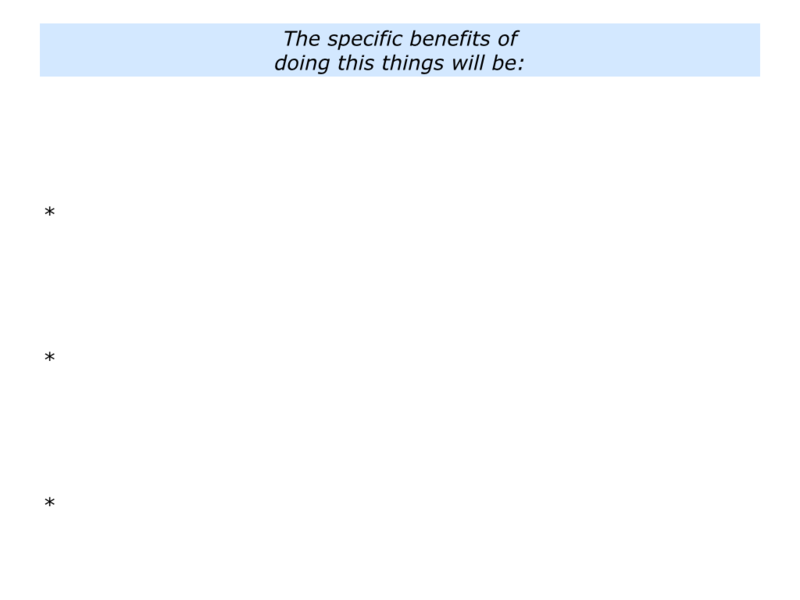 Bearing in mind the suggestions you have already compiled, you may wish to translate these into a clear action plan. If you wish, try completing the following exercise.